Huge shout and thank you to Bonnie Feifer and Alison Friedricks Interiors for accessorizing my home and giving it the finished look it so desperately needed. They stayed within my budget and were a pleasure to work with. 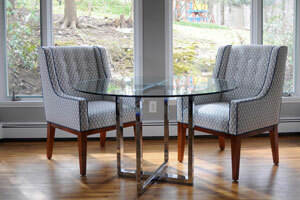 I love that they worked with my existing furniture and did not consider my job too small. I highly recommend them! imagine tackling our house projects both big and small without Alison and her team. Thanks so much to Alison and the Alison Friedricks Interiors team! Alison coordinated our entire kitchen renovation project and we are thrilled with the result! Alison had great ideas, was extremely responsive and made sure everything was completed on schedule! I can't wait to start a new project so I can work with Alison and her team again!!!! furnishings as possible in our newly finished rooms. her for any room in your house. Off the charts great! Attentive to detail- classy, stylish - with the times! Alison Friedricks Interiors - thinking with their heads - thinking outside the box. I know first hand after moving from a house to a townhouse - this month - this week - this day. I love the furniture - love the color scheme and respect and appreciate the incredible personal touch by Ali. We can only say good things about the help we received from Alison Friedricks Interiors when we downsized this year. Their help was invaluable-- measuring, selecting what to reuse and then placing the pieces in our new home. We would always strongly recommend them to anyone thinking of downsizing. I worked with Alison Friedricks Interiors on two occasions to stage high-end properties for sale. Alison had a wonderful relationship with the property owner and understood how to showcase the property best. As I full time Real Estate Broker, I rely on a network and team of service providers that are able to provide my clients with the best advice and service to accomplish their real estate goals. One of the most important parts of the selling process is preparing your home for the market. Alison Friedrick’s of Alison Friedrick's interiors is instrumental with my clients by consulting with them to make suggestions of how to stage and make changes to their home that will bring out the best of the space and surroundings. What is great about Alison is she does not focus on how much money someone needs to spend but more important is her eye for the subtle changes that most people overlook. Alison is a very caring and compassionate person. When she works with a seller who is transitioning to a new home it can be a very difficult and emotional experience. I highly recommend Alison!